Encouraging people to share links to your website or blog posts is an important strategy for promoting your articles. Make it easy for them with Twitter buttons and ready-made tweets. Social networks are great places for sharing links and you can share them yourself from your own social accounts of course. However, you should serious limit the number of shares you post or you could be labelled a spammer. Facebook and others might limit your account for over-sharing. A much better way to promote your site or latest blog post is by getting other people to recommend it. A link from someone else is much more valuable than a link by yourself promoting yourself. Sharing buttons at the top, bottom or side of the web page is a great way to encourage people to share your posts, but it is not the only way and you can provide people with ready-made tweets. 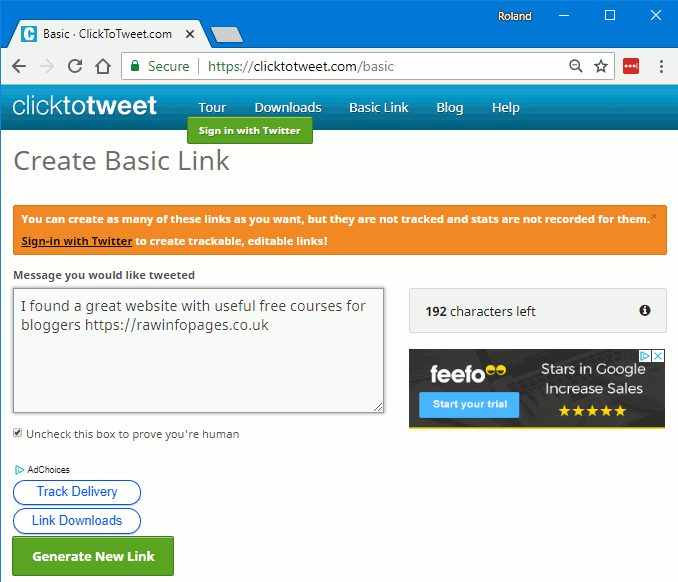 There are several ways to use the ClickToTweet website and there are a lot of features are for paying subscribers, but a free account is available that enables you to create up to five links a month and there is also a no-account option – it can be used without an account. Go to the Basic Link section of ClickToTweet, which does not require an account. Enter some text into the message box and then add a link (optional). Twitter limits the number of characters in a tweet and the remaining characters is displayed on the right. When you are happy with the tweet, click the Generate New Link button. 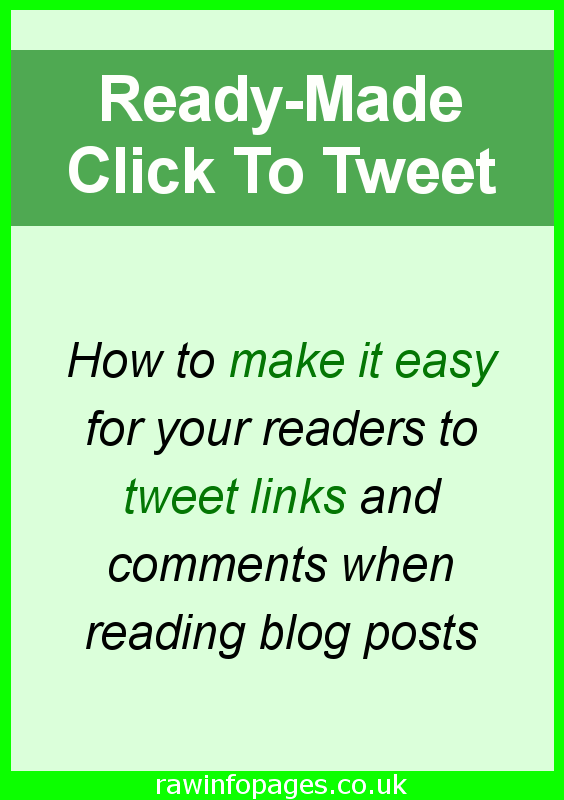 The ClickToTweet site creates a shortened link and it can be seen on the right above. Click the blue box and the URL is copied to the clipboard. 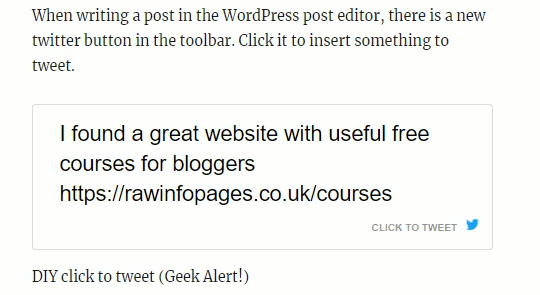 Select some text in a WordPress post and press Ctrl+V (PC) or Cmd+V (Mac) to create a link. You can also click the link button in the post editor toolbar. Try it and check that it creates the tweet. It is quick and easy to use, and it can be inserted into emails if you have a subscriber list. 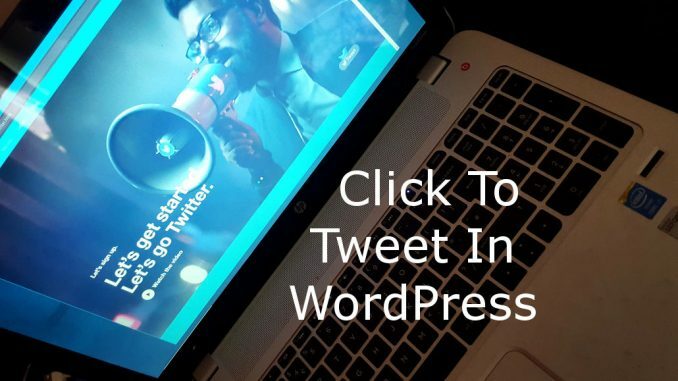 There is an official ClickToTweet plugin for WordPress but for some reason Better Click To Tweet is more popular – five times more installations and a higher star rating. 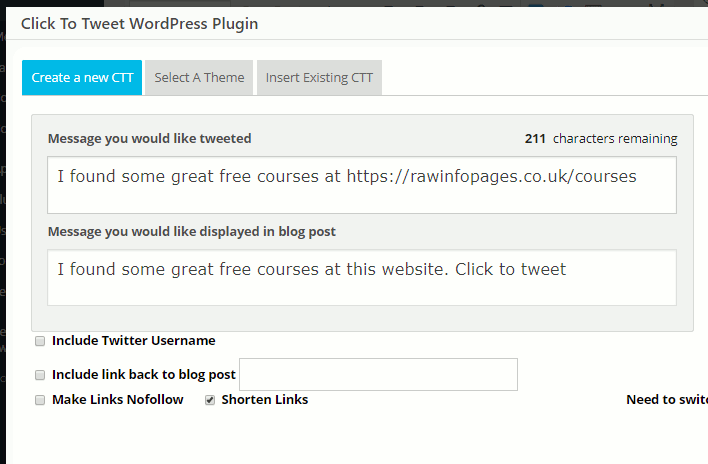 The plugin is up to date and has been tested with the latest version of WordPress. Creating tweets in articles is very easy and a new icon is added to the toolbar in the post editor. Click it and a panel opens into which you can enter a tweet. Keep it short as Twitter requires, and click OK. This is how the tweet looks in the post editor and it is a special shortcode. The theme your website uses might make it look a bit different to mine, but there will be a neat boxed ready-made tweet that just needs to be clicked to share on Twitter. ClickToTweet website has a ClickToTweet plugin that offers more features and options than Better Click To Tweet. However, it has fewer users and a lower rating in the WordPress plugins gallery. That’s odd and it is worth considering. Add the plugin in the usual way and activate it. Go to Settings > Click To Tweet and there are options to choose a template for the tweet, the call to action, the colour and the font size. The template can also be selected when inserting a tweet and there are other options on tabs, such as selecting an image and more. 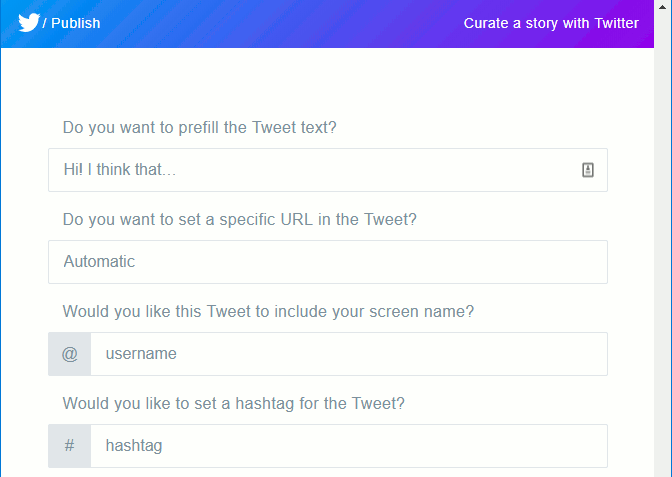 If you want to customise and experiment with ready-made tweets, and track them on the website, this is a useful plugin. You need to login with your Twitter account to use the plugin and perhaps there are just too many features. The simpler Better Click To Tweet is certainly more popular. 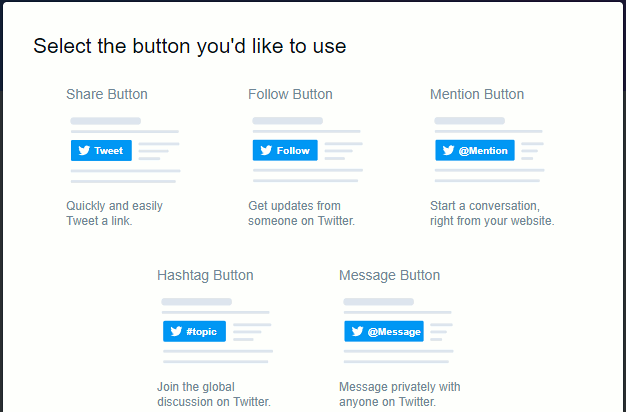 If you want to create buttons with links to make it easy for people to follow your Twitter account or view tweets, Twitter has the tools you need at publish.twitter.com. 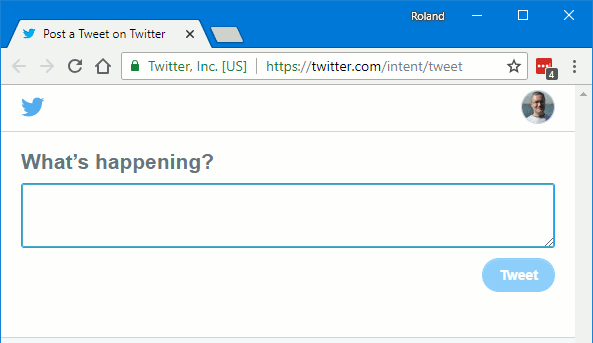 Go to the site and there is a simple box in the middle waiting for you to enter a link, such as a tweet, a collection, a profile, a moment, a handle or hashtag. Ignore them and scroll down the page to this selection and choose Twitter Buttons. The others have their uses but here we are concentrating on creating buttons and links to embed in web posts. There are five different options and all are useful one way or another. What type of button would you like? They are simply buttons, but you can place them within text, after text, under or above images and so on, with a message to Click To Tweet. Lets create a Share Button to tweet a link. Click theitem in the top left corner. The result is this and there is a line of code and a Copy Code button. It works as it is, but it can be improved by clicking the link, set customization options. There are several options and the most important ones can be seen in this screenshot below. There are more farther down the page. For example, you can prefill the tweet text. If you don’t specify the text, the title of the post and website is used. The automatic URL option automatically adds the URL of the current web page and is usually best left as it is but you can set a URL if you want. You can add your Twitter name and add hashtags to the tweet, and there are more options, like the button size. When you have finished, click the update button to return to the previous screen and then copy the code. Paste it into a WordPress post in text mode. Click the Text tab, find the text or image you want people to tweet and paste in the code. Here is what it looks like. Try it. 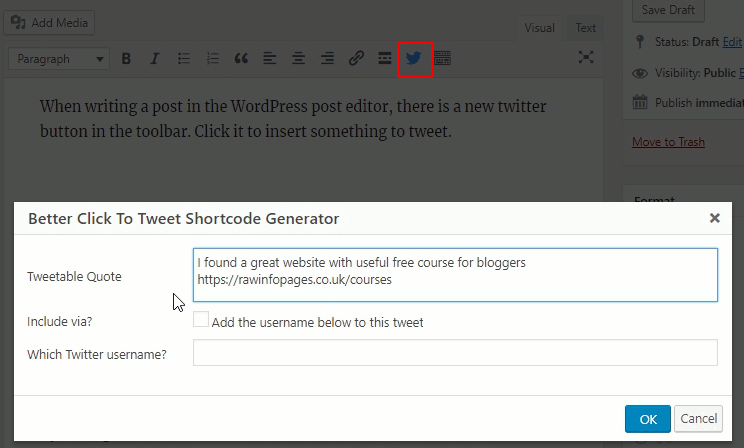 By adding some code to the end of the URL we can auto-fill the text box with a tweet. All the user then has to do is click the Tweet button. Although we want the web link at the end, it must be put at the start. An added complication is that spaces are not allowed and must be replaced by %20. Some text editors let you do a search and replace, which is easier than deleting spaces and typing %20s. Here is the whole URL (lines are split on the web page, but it’s all one long URL). Click it. Which tweet method do you prefer? 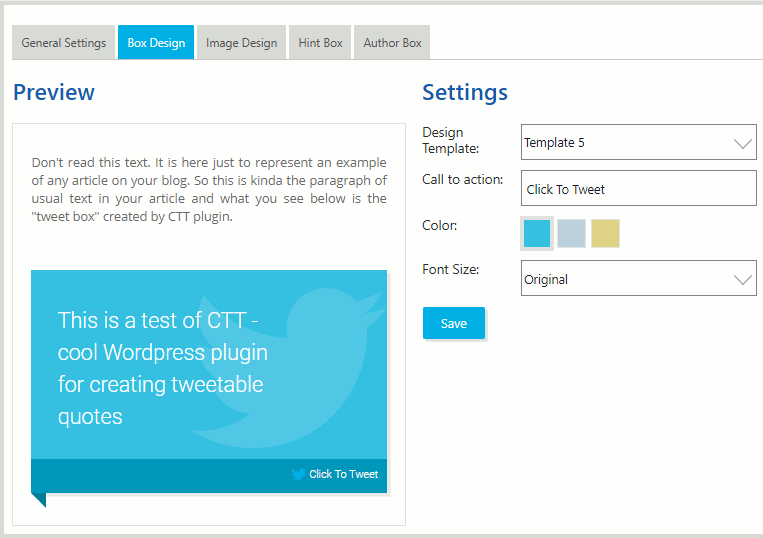 ClickToTweet, a WordPress plugin or the DIY method? Thank you for this as I’m just getting started with Twitter! Is this only for Word Press or is this available for us folks still using blogspot? Only the WordPress plugins are specific to WordPress. The ClickToTweet website and the manual method shown at the end should work ok on Blogger/Blogspot.